Before deciding on a new residence, it is important to consider security. Follow these guidelines before signing a lease to help protect yourself and your family. When you think you’ve found your dream apartment, check local crime data in its vicinity. Make sure you know about any troubling activities in the area before committing to a lease. Talk to the local police and your future landlord and neighbors to get an honest picture of what life will be like in your new place. 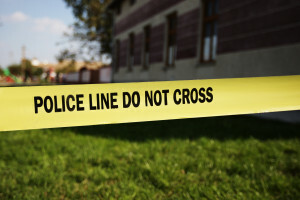 Websites like CrimeReports.com, CrimeMapping.com, and SpotCrime.com can give you a good idea of the local crime history in almost any community. Robbers and intruders prefer to sneak around in poorly-lit or dark areas. Therefore, when considering an apartment, check the entrances, hallways, walkways, parking areas, elevators, stairways, mail areas, and laundry rooms to make sure they have enough lighting at night. The fewer places an offender has to hide, the safer you’ll be. A peephole can keep you and your family safe by allowing you to see who’s at your door before you open it. If your door does not have a peephole, inquire about having one installed before you move in. When a questionable character is at your door, a peephole will help you and your children avoid any compromising situations. Once you’ve found your dream apartment, keep your family and valuables safe with ongoing security measures. For added safety, consider installing a deadbolt and chain lock if your door doesn’t already have them. A deadbolt is more secure and difficult to pick than a standard doorknob lock, because the deadbolt only opens by rotating the lock cylinder, whereas a spring bolt lock can retracted by applying force to the bolt itself. Additionally, a chain lock provides an extra layer of security when opening your door, allowing you to open your door a crack to talk to a stranger or ask for identification, before opening up completely. Balcony doors are great for sunshine and views, but they can pose a hazard if they are not properly secured. An unsecured sliding door can provide an intruder with a relatively untraceable and quiet entrance to your place. While it’s important to always lock your balcony door when it’s not in use, many sliding doors have inadequate locks and come off their tracks with just a nudge. For optimal security, make sure to arm your sliding door with an inside bar lock or a pole on the track. You can also install a secondary locking mechanism with a metal pin inserted through the doorframe and into the sliding door. Good blinds may prevent robbers from looking inside your home and being tempted by all the valuables they see. Install blinds that completely block the view from outside, and make sure to close them when you go out. That way, you’ll keep wandering eyes from scanning your valuables and reduce your risk of break-ins. A safe can be a last line of defense to protect your most valuable and irreplaceable possessions. Items such as jewelry, cash, firearms, and sensitive documents can be locked away in a fireproof case. Safes come in all sizes and range in price from under $100 to thousands of dollars. Find a safe that fits your budget and needs, and talk to your landlord about bolting it to a floor or wall, so a burglar can’t pick it up and take it. While a safe can’t guarantee the absolute protection of your property, it can be effective at hiding items from thieves who are just looking to grab valuables in plain sight and escape quickly. Renters insurance will protect the value of your possessions in case they are stolen or destroyed by a disaster. Your landlord may have an insurance policy, but those generally only cover the building you live in, not your personal belongings. Many insurance companies offer policies specifically for renters that run about $20 a month and cover all your property at the full replacement cost. Renters insurance can also protect you in case of a liability lawsuit where you are deemed responsible for the damage of another tenant’s property. You may think you don’t own very much, but consider the cost of replacing everything you own in the event of a theft, fire, or severe weather. If you wouldn’t be able to recover from the loss, then renters insurance is a good option. Renters are 85% more likely to experience a home invasion than those who own their homes, and while many security companies won’t sell to renters, some will (source). In the past, security systems were not renter-friendly due to an intrusive installation process, but now renters have several options. Read the complete Safewise Apartment Security Guide for Renters here. Advocates for victims of apartment violence and security negligence at The Murray Law Firm urge our readers to take apartment safety into their own hands and to work with their apartment owners, managers and neighbors to create a safe and secure home for their families. The Murray Law Firm has extensive and successful experience in representing victims of violence and apartment security negligence. We offer our legal assistance, if desired. We represent our Clients on a contingency agreement, which generally means that no fees or payments are owed until and unless we recover. Anyone seeking further information or legal representation is encouraged to contact us via e-mail (click here) or by telephone at 888.842.1616. Consultations are free and confidential.